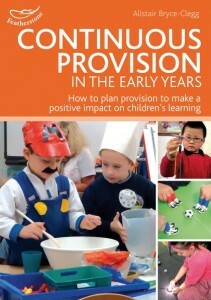 How to plan provision to make a positive impact on children’s learning. Based on Alistair’s extensive experience in school, this book brings together his knowledge of Continuous Provision and the high level impact and engagement that it can bring. He explains what Continuous Provision is, how to link it to assessment and provides numerous case studies and illustrations of how this works in practice. This book will help practitioners plan their provision (indoors and out) so that it provides carefully structured learning opportunities. I’m loving all these ideas and the value you put on the quality of their learning experiences. I heard about your website from a colleague at a teachers cluster meeting in Bangor N.Ireland. Excited to be more inspired by your stuff! !